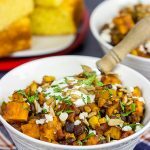 Looking for a tasty new dinner side dish? 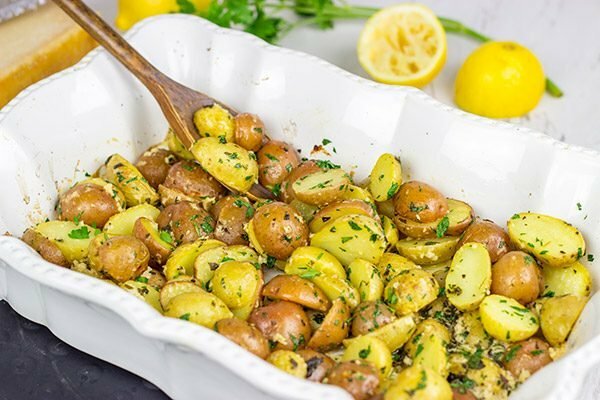 These Lemon Parmesan Roasted Potatoes are easy…and packed with flavor! Oh, toddler toys. I have a love/hate relationship with toddler toys. On the one hand, I love that they entertain Robbie. And a lot of the toys these days really are quite educational. I credit Robbie’s puzzles with helping him learn his ABC’s. I also credit Robbie’s puzzles with giving me shooting pains in my foot when I step on rogue pieces. I swear those pieces just blend into the rug…until my foot finds them! Our house used to be all organized and (mostly) clean. Now I consider it a win if I have a walking path through the toys. In all seriousness, though, I don’t mind Robbie’s toys. He’s a kid. Pretending to be a pirate in his tent or walking around growing like a dinosaur (did dinosaurs growl?) is his imagination at work. And soon he’ll be old enough to build forts out of blankets and chairs. I’m thinking Dad might have to get in there to supervise that one. And by “supervise,” I mean help. 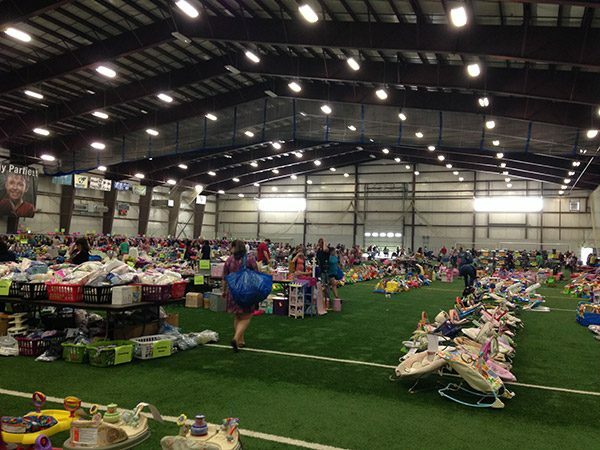 Those will be some epic forts…stay tuned on that front! But let’s shift gears from kid’s clothes to these Lemon Parmesan Roasted Potatoes. I went to make these potatoes the other day, and I pulled up my site on my phone to get the recipe. Lo and behold, “No recipe found.” Say what!? 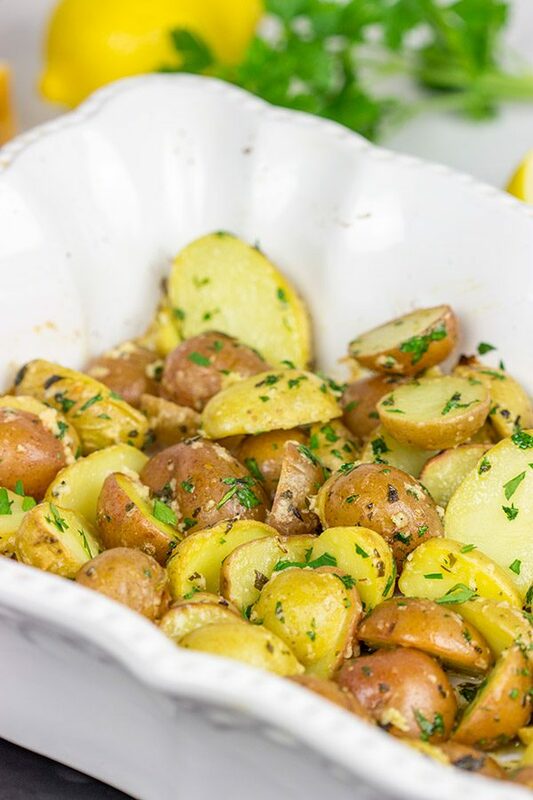 Somehow I’ve managed to never post this Lemon Parmesan Roasted Potatoes recipe. 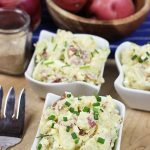 This recipe is one of our go-to side dishes, and these potatoes make frequent appearances on our dinner plates. 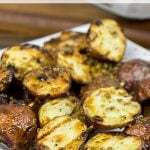 I’ve toyed with the recipe for these Lemon Parmesan Roasted Potatoes over the years. It first started with chopped red potatoes, but then I discovered baby potatoes in the store one day. Now we use baby potatoes. And I don’t always add in the fresh parsley at the end. If I happen to have leftover parsley from another recipe (or parsley growing in the garden in the warmer months), then I use it. If not, I stick with dried herbs. This is a simple recipe, but it’s packed with fresh, bright flavors thanks to the lemon and Parmesan cheese. 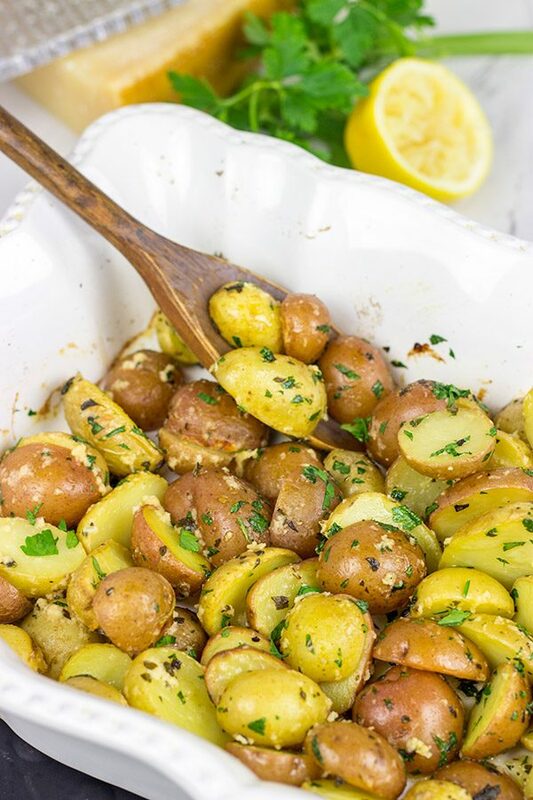 If you’ve been feeling a bit tired with your go-to dinner side dishes, add these Lemon Parmesan Roasted Potatoes to the mix! Other than grabbing some baby potatoes on your weekly grocery store run, chances are you already have everything else you need. They’re quick and easy to make, and they’re one of our favorites. And now I have the recipe here on the site so I can find it in a jiffy. Enjoy, my friends! And let me know if you happen to see that Pooh Bear sweater in a men’s large! Using a large bowl, add 1 Tbsp of olive oil, lemon juice, salt, oregano and halved potatoes; toss until well coated. Using a large baking dish, brush bottom of dish with the remaining 1 Tbsp of olive oil. Sprinkle Parmesan cheese evenly across bottom of dish. Place potatoes cut-side down into baking dish. Roast for 38-40 minutes, or until potatoes are fork tender. Before serving, toss potatoes with fresh parsley. We have a walking path through toys and ripped out stuffing in our living room from our fur baby. I don’t mind, though, he get a lot of enjoyment out of them, so that’s the main thing. Robbie is growing up so fast!! Cute pic! Haha! I know all about the walking path through stuffing from dog toys. Both of our pups used to rip apart those toys within about 15 minutes. Now they seem more content to just carry them around. And, yes, Robbie is growing like a weed these days! That photo was actually taken a couple of months ago, too…so he’s even bigger now. Bigger boys mean bigger toys…which means more to avoid in our house. 🙂 Thanks, Dawn! Robbie is getting so big! He is a cutie!! These potatoes sound like a great side dish. We love potatoes at our house, so I must try this. Potatoes are such a good side dish! I love a good baked potato with the classic toppings, but sometimes you just need to mix it up…and this lemon + Parmesan version is a great way to change up the flavors. And, yes, Robbie is growing so quickly. It’s crazy! Thanks, Dawn! I’m giggling/wincing in pain because this post reminded me of how painful it was growing up with a lego-obsessed brother. He left his pieces everywhere so I know those shooting pains you’re talking about. And if you happen to see Robbie’s Pooh sweatshirt in a women’s small I’ll take one too. Pooh is my favorite children’s character ever! So I’m coming over for dinner tonight. You’re serving these potatoes right? LOVELOVELOVE roasted potatoes! Umph. Legos. Robbie hasn’t gotten into Legos yet, but I can only imagine the pain. They’re so small. And with sharp corners. Give me about 2 years, and I’m sure I will be writing a post about having to find a bandaid in the middle of the night after I stepped on a Lego. As far as dinner tonight, potatoes are indeed on the list! 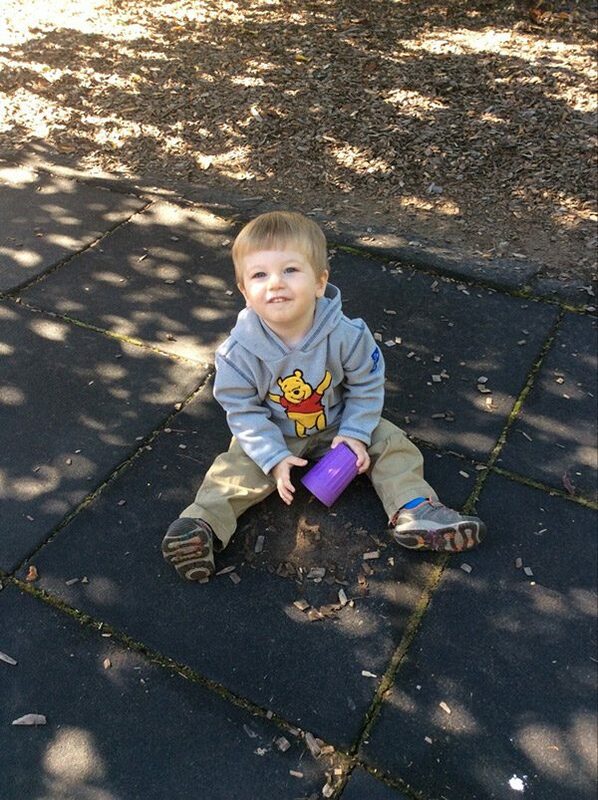 Come on over…and I’ll see what I can do about finding you a Pooh sweater in the meantime. 🙂 Thanks, Kelsie! I just wonder how this recipe would do in either an Air Fryer or Instant Pot? That’s a good question, Sherry! I don’t have an Air Fryer or Instant Pot, but I have been very, very tempted to get an air fryer. Maybe one day soon! Based on reading recipes for those appliances, I think this recipe would work quite well…at least for the air fryer. I don’t know as much about cooking potatoes in the Instant Pot. If you try it out, will you swing back by and let me know? Thanks!! I love potato dishes like this, simply flavored because, let’s face it, potatoes are just delicious all by themselves. But lemon and parmesan makes them that much better!! I can’t believe how big Robbie is getting! And score on the Pooh sweatshirt! I totally agree with you, Marissa! Potatoes are delicious. I love a good, classic baked potato, but sometimes it’s fun to mix it up a bit. The lemon + Parmesan in this recipe is quite tasty! And, yes, Robbie is growing like a weed. I can’t believe how tall he’s getting…and he’s short for his age, too. Pooh sweatshirt for the win! Although we don’t have toddler toys, sometimes our home looks like a disaster. I don’t know the reason. Andrey keeps saying I’m the one who makes this chaos, but he’s wrong. I’m a pretty well-organized person, I swear! We also do like potatoes, and this combination of herbs, lemon, and cheese (No garlic? Hmmm) is delicious! Andrey blames you for the chaos? No. I disagree! I think he should be thanking you for creating all of those amazing recipes you keep posting. After all, it’s not like you have deviled eggs sitting in the middle of the floor (well, I hope not at least…haha). Ah, and you’re right that garlic would be a great addition to these potatoes. I can’t believe I’ve never thought of that. Next time I make ’em, garlic is going in! Thanks, Ben! My father and I love baby potatoes. We also prefer keeping the skin intact in it because that gives a very different flavor to it. We do not actually roast it but we fry it in a oil with little turmeric powder, chili powder, and salt. I totally agree about keeping the skin on baby potatoes! Heck, I like the skin on for all potatoes. When I was a kid, I wouldn’t eat the skin of a baked potato (like a Russet), but now a good crispy skin is my favorite part! Thanks so much, Puja! And I agree that Robbie is a cute kid. We just did an Easter egg hunt with him this past weekend, and it was awesome to see how excited he got! I’m all about lemons and freshness and spring at the moment David. Basically any great recipe that takes me away from this continuing wintry weather we’re still having here in Scotland, despite it apparently being spring now! This recipe fits that bill perfectly. The combination of lemons and parmesan cheese is heavenly! Just wonderful. And pretty! I like the addition of oregano and the parsley. I’m such a potato girl. I used to say I’m part Irish because I love them soooo much, but as the years pass I have to limit my potato exposure since they are a bit starchy and love to stay around my waist line lol. Toddler toys look fun but I think that’s because I have no toddlers lol. Forts are the best! My Dad always built the best forts. David, Robbie is getting so big!!! I agree that you have to be careful with potatoes, Mary…but everything in moderation, right? 🙂 This side dish is one of my favorites. Also, Robbie is indeed getting so big these days. Believe it or not, but that photo was actually taken a couple of months ago…so he’s even bigger now! oh those are some of my favorite flavors, I bet these are delicious! and who doesn’t love potatoes?!! PS: what a cute photo of Robbie, he is adorable! The dreaded toy obstacles that kids leave! Hayley’s got a ton of nieces and nephews and it’s always a…challenge,weaving through a former play zone. Legos are seriously some of the worst! Those things hurt! Ah! So you are well aware of the trials and tribulations that come with toddler toys. I’ve heard that Legos are the worst…and I suspect that things will be getting worse before they get better in the “stepping on toddler toys” department around here. Either that, or I just need to start wearing shoes to bed! Thanks so much for the comment. 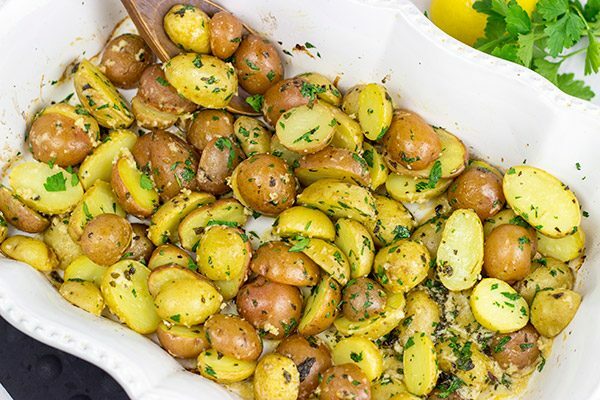 These potatoes really are one of our go-to side dishes. And since potatoes store well, we often keep a basket on the counter…that way, this recipe is always ready to go! Yay for baby potatoes! I have a thing for mini sized foods and always nab the baby potatoes over bigger ones. And I’ve been really into using fresh lemon these days, as well as fresh herbs from my garden. This looks like a great side dish! Mmm, those potatoes do sound good.